We are the exclusive UK agents for the world's finest honing and grinding machines - Manual, NC and CNCcontrolled. We can provide project management and organise customer trials. Rolls Royce approved supplier. 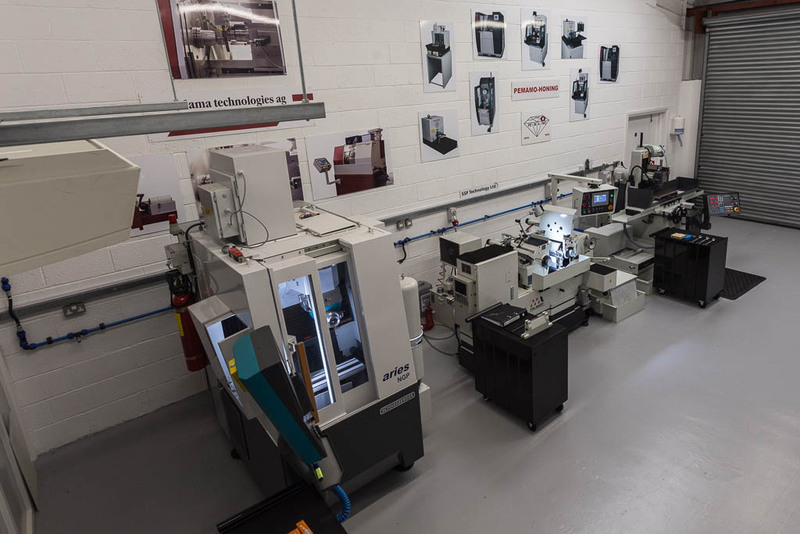 Our purpose-built demonstration and training facility houses a range of Pemamo precision honing machines, Schneeberger tool and cutter grinders, Palmary centreless, cylindrical and internal grinders and Wimmer cutting-off machines. See the full range at www.ssptech.co.uk We also attend and exhibit at National & International trade shows, come and find us at GridTec2018, Mach2018 at the NEC - Birmingham and the next EMO2019 in Hannover. SSP can also advise on and act as consultants for any Honing, Grinding, Lapping and Part Marking Project. As UK Distributors our impressive machine line-up includes:- Pemamo SA Honing Machines, Schneeberger Multi-Axis Tool & Cutter Grinding Machines, Palmary Grinding Machines, Schilling Part Marking Systems, Dama Grinding Machines, Wimmer Cutting-Off Machines, plus General Honing, Grinding & Lapping Consumables.